Before the D3400, you chose your smartphone camera for convenience. Zooming was clumsy. Shooting in low light was nearly impossible. Capturing fast action was a game of luck. But after the D3400, you'll see that you were compromising image quality. That some of the greatest photos happen when the light is low. That fast action can be frozen in perfect clarity. And that a camera and a smartphone can work together in harmony to make the photos you share absolutely amazing. Photos and videos captured with the D3400 and a superb NIKKOR lens are as vibrant and lifelike as the moments they preserve. Shoot in extremely low light without a problem. Freeze fast-action in its tracks. Create portraits with rich, natural skin tones and beautifully blurred backgrounds. The photos you share will amaze everyone—even yourself. SnapBridge has changed the way cameras and smartphones work together—and only Nikon has it. Take a picture with the D3400 and it's automatically transferred to your compatible smartphone or tablet, ready to share. SnapBridge works seamlessly with NIKON IMAGE SPACE, a cloud storage and sharing site, to back-up your photos and to help you create and share albums with your friends and family. The future of photo sharing is here. Easily pairs with up to five smart devices; always connected. Photos automatically appear on your smart device. Create and share albums on the go with a free NIKON IMAGE SPACE account. Backups are automatically stored in the cloud on NIKON IMAGE SPACE. 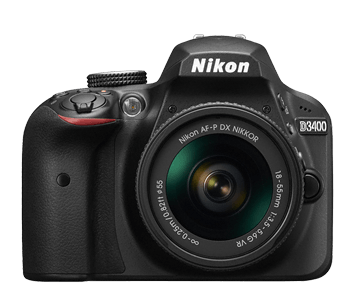 Compact and lightweight, the D3400 is designed to go everywhere you go. Even first-time DSLR owners will quickly feel at home—the camera's controls are smartly laid out for comfort and intuitive control. The bright optical viewfinder provides a sharp, glare-free view of the world, and the comfortable grip enables precise handling. The D3400 makes photography easy and fun, freeing you to focus on your natural talents—framing great shots, anticipating special moments and finding unique perspectives in everyday scenes. As your abilities grow (and they will grow) you can take complete creative control of the D3400. Learn while doing; the D3400 actually teaches you how to use it with step-by-step instruction, right in the camera. Nearly 100 years of Nikon know-how is programmed into the D3400 for outstanding results, effortlessly. At the touch of a button, the D3400 records dazzling 1080/60p Full HD video. Nikon's new AF-P DX NIKKOR 18-55mm f/3.5-5.6G VR lens uses a stepping motor for smooth and quiet autofocusing, so only the sounds of the moment are recorded with D3400's internal mic. Press and hold the D3400's shutter button and capture 5 FPS continuously with full autofocus performance. Transform a moment of fast action into a thrilling photo sequence, then share it through SnapBridge for all to see. Nikon cameras have some of the finest autofocus systems available. The D3400's AF system quickly acquires your subject and provides precise focus, even during high-speed shooting and low-light situations. Legendary NIKKOR lenses have long been the benchmark of optical excellence, and every lens offers an inspiring new view of the world. Grow your capabilities. Nikon's exciting Picture Controls make it easy to get creative with your photos and videos. Choose from six preset options that enhance the colour and tonal characteristics of your images, then customize selections for your own personal style. The Nikon SnapBridge application must be installed on a compatible smart device before it can be used with this camera. Images downloaded to the smart device with version 1.x will no longer be displayed in the Gallery after you upgrade to version 2, but can be viewed in the “Photos” app provided with the smart device. SnapBridge 2.5 does not require that camera firmware be updated. Compatible devices are those capable of acquiring location information and those that support BLE (iPhone® 5 and later, iPad® 4th Generation and later, iPod touch® 5th Generation and later, iPhone X). The Bluetooth® word mark and logos are registered trademarks owned by Bluetooth SIG, Inc. and any use of such marks by Nikon Corporation and its Affiliates is under license. This camera supports autofocus with AF-P and type E and G AF-S lenses only. Non-CPU: Autofocus not supported. Can be used in mode M, but exposure meter does not function. Type D PC NIKKOR: All functions supported except Autofocus, 3D Color Matrix Metering II and some Shooting Modes. Type G AF NIKKOR not equipped with an autofocus motor: all functions supported except autofocus and 3D Color Matrix Metering II. Camera must be set to M exposure mode (manual exposure). Selecting any another exposure mode disables the shutter release. Aperture must be adjusted manually via the lens aperture ring and the camera metering system and i-TTL flash control cannot be used. Our apologies. We just ran out of this item.